​through which the world has been crucified to me, and I to the world. Recently I have been struck by the singularity of God's Kingdom purposes as I prepare an Introduction to Islam course I have been invited to teach at the Seminario Bíblico de Colombia in Medellín, Colombia. As Easter Sunday approaches the nearness of this triumphant celebration juxtaposed my research for the course has given way to deep personal contemplative reflection on the death, burial and resurrection of Jesus of Nazareth, without question the most intriguing ponder anyone will ever embark upon if they choose to give themselves to such endeavor. God's singular Kingdom purpose of Jesus as Inaugurator, High Commissioner, Principal Educator and Practitioner of God's Kingdom reign on earth by virtue of a foreordained supremacy granted Him as Son of God, joint Creator and Divine Man over the natural forces of creation, unseen spiritual powers, physical sickness and death, yes even his own, is nothing to scoff at or ponder lightly. Rather, such rumination ought to bring one to deep introspective recognition of not only the uniqueness of this historical Jesus and therefore arrive at the logical conclusion He is indeed the One He said He was --Messiah, Savior, God in flesh--, but also create an awe of God's amazing and wonderful singularity of the Gospel story over and against any other narrative, religious or otherwise. These ideas have governed my preparations and, although attempting to be as objective as I can, will no doubt show through. Nevertheless, this is the joyful springtime thrill that Easter offers any and all for the taking, as well as the year-long steady trek of faith that is what will finally matter in the end. 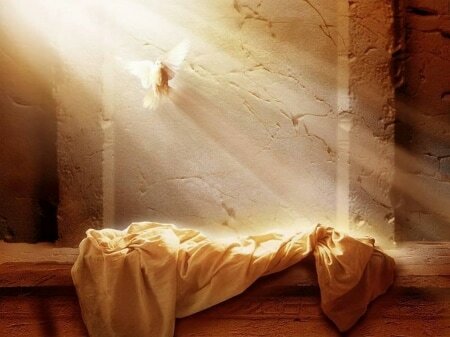 I purposefully keep this reflection short as I invite you to read the following excellent Easter Reflection from my mentor and good friend Martin Accad [click here].